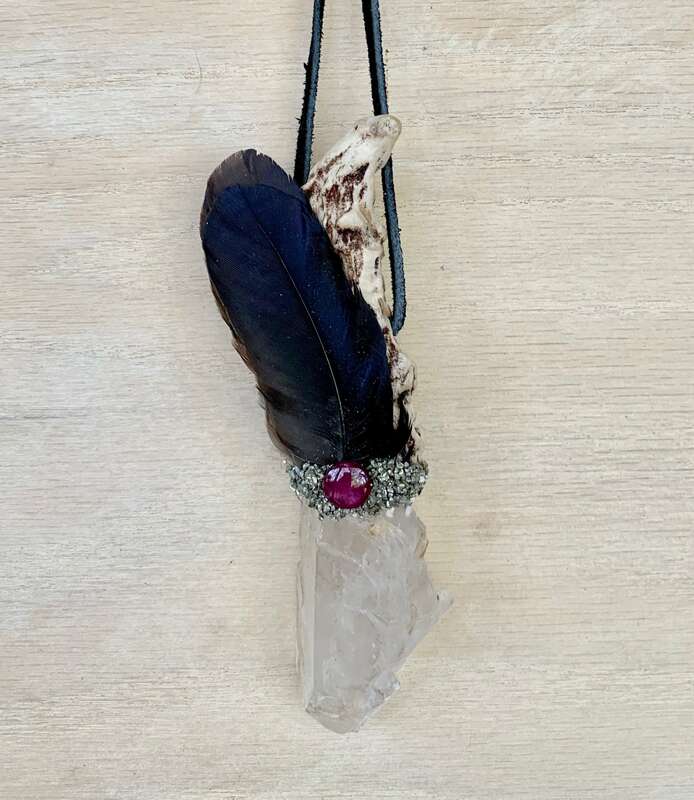 Accelerates Spiritual Growth, Empowers Connection to Higher Realms & Opens the Heart to Unconditional Love; Promotes Healing & Psychic Development; Offers Protection; Encourages Individuality, Openness, Receptivity, Grounding, Happiness, Generosity & Prosperity. Deer Antler – Deer medicine brings adaptability, flexibility, often indicates a new adventure. Deer are known for their innocence, gentleness and love; antler symbolizes a connection to Higher Wisdom. Stags are often used to symbolize the Goddess as well as the Heart. 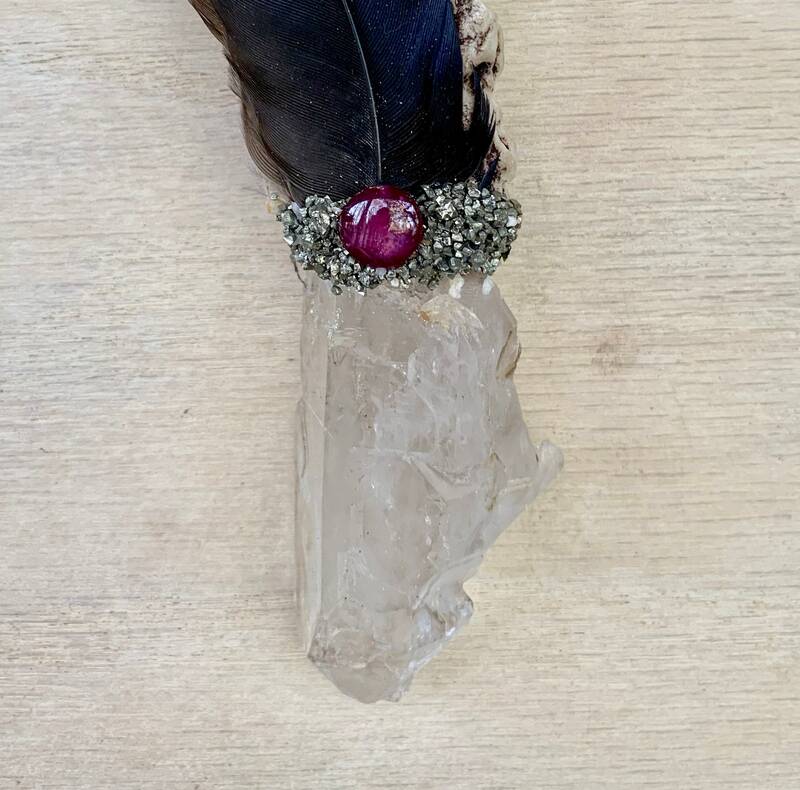 Elestial Quartz - crystals have an extremely high vibration and are powerful stones to aid your spiritual growth. Have a high vibration that helps you to make a stronger connection to spirit. These are powerful stones to use in meditation... as they will help you to open stronger connections to the spirit world. 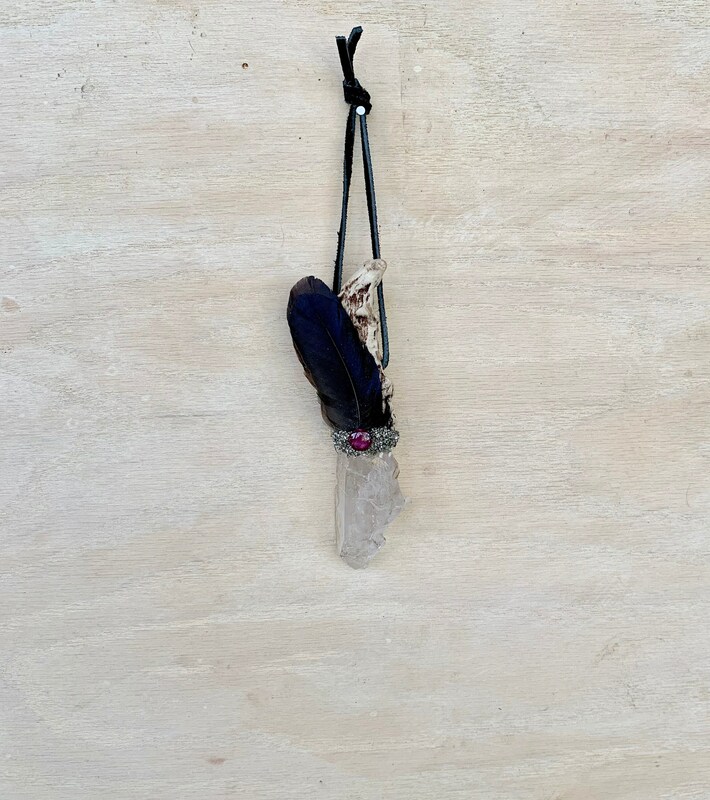 They are known to open the crown chakra and then in turn open the soul star chakra and higher crown chakras... assisting the flow of Divine energy to move down throughout your entire chakra system. Star Ruby - opens your heart past the boundaries of personal love and passion to unconditional love. Brings you into alignment with Divine will. It brings freedom, flow and peace. It assists you in removing lethargic, dormant energies in your physical body, emotions and mind. Brings integrity, devotion and happiness. It also enhances generosity and brings prosperity. It protects your home, material possessions, children and anything you feel a deep attachment to, as well as offering psychic protection. It is a stone of high energy and power that promotes healing on all levels. Pyrite - a stone of intellect and protection. It enhances intelligence, mental stability, logic, analysis, creativity, memory, and psychic development. It can help you tap your own latent mental talents and abilities. Pyrite is a powerful protection stone and is very grounding. English Carrion Crow Medicine – Feathers - instills the wisdom to know ourselves beyond the limitations of one-dimensional thinking and laws. We are taught to appreciate the many dimensions of both reality and ourselves, and to learn to trust our intuition and personal integrity. Also teaches us to be mindful about judging people automatically. Are messengers, telling us about the creation and magic all around us, that is available to us just for the asking. Look for opportunities to bring into being the magic of life. 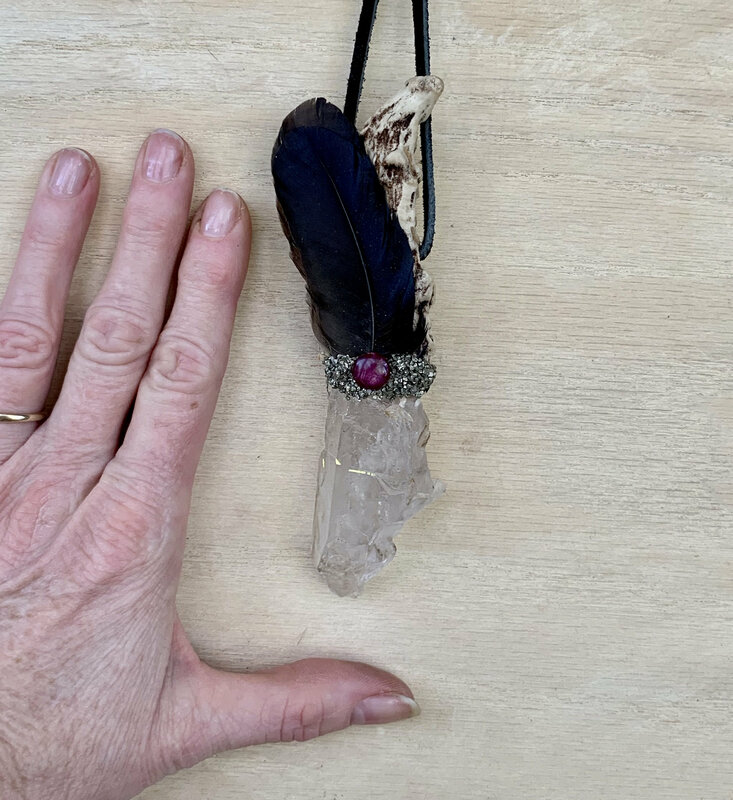 6.5 inches, Elestial Quartz 3 inches.